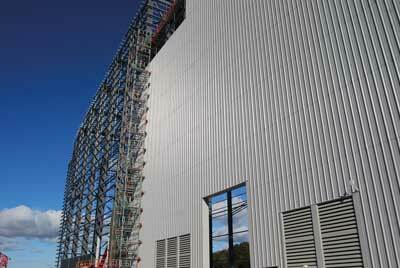 Construction work is progressing on a 21.5MW steel-framed waste wood biomass plant at Ince in Cheshire. Steel tonnage: 3,500The need to deliver alternative sources of energy production has seen many biomass facilities built throughout the UK in recent times. A renewable and sustainable source of generating electricity, the most common materials used as fuel in the process are either straw or wood. 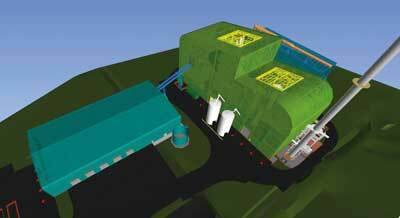 A £100M biomass plant under construction at Ince near Ellesmere Port in Cheshire will use the latter and harness ‘Advanced Gasification Technology’ to process up to 170,000t per year of recovered waste wood, enough to power around 40,000 homes per year. All of the fuel will be sourced from the local economy and a timber processing plant is also being built on a nearby site in order to safeguard supply. Construction is being undertaken by contractor MBV Energy – a joint venture between global engineering firm MWH Treatment and US-based Black & Veatch – while Finland-based technology firm Outotec Energy Products is the main technology subcontractor. MBV has in turn engaged Ward & Burke on a design and build contract to undertake the civils works on the site. As well as extensive groundworks this programme also includes the construction of the project’s large steel-framed structures; the main process building and a fuel reception building. 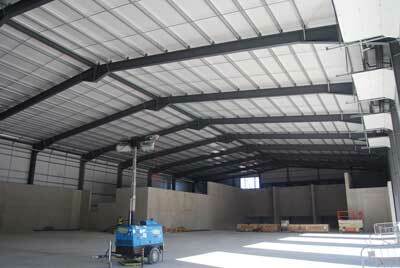 Taking the lead role in the design of the steel-framed structures, Ward & Burke subsequently contracted EvadX to fabricate, supply and erect the steelwork. Because of the height of the main process building, which reaches a maximum of 40.3m-tall, and the large column-free spans required, steel was chosen as the most cost-effective framing solution for the project. However, prior to steelwork arriving on-site a huge preparatory scheme was undertaken, which included the installation of very deep piles. The foundations support concrete slabs and hard-standing areas which have a thickness of up to 650mm in places. The concrete thickness is required because of the huge loadings of up to 2,000t per m² that will be exerted by the facility’s processing equipment. The early completion of the slabs and hard-standing areas was a boost to the steelwork programme as EvadX had a clean hard surface to operate its MEWPs and cranes on, as well as plenty of space to temporarily store materials. With cast in bolts in place within the concrete slab, steel erection began in July 2016 and was completed in November. EvadX initially erected a large fuel reception structure which is where the wood chip will be stored before being delivered into the process building via a conveyor system. This large portal-framed building measures 70.6m-long × 36m-wide and reaches a height of 9.8m to the underside of its eaves. With delivery trucks entering and exiting at one end of the building and a large storage area positioned at the other end, a large column-free portal frame structure was the best possible design solution for this building. Spaced at 8m centres the 838UB perimeter columns support a series of spliced rafters to form the 36m clear span. The rafters were brought to site in 18m lengths, bolted together on the ground before being lifted into place by EvadX’s on-site 80t-capacity mobile crane. Having erected the fuel reception building, EvadX began the work to construct the adjacent main process structure. This building has a highly architectural design consisting of two sloping roof sections, separated by a high-level valley. One roof section peaks at a height of 43m, while the adjacent section has a maximum height of 32m. “Because of the height the building had to be a large steel-framed braced structure, and because there are very few windows positioning bracing in every bay was not a design problem,” says Mr Bruton. The process building’s columns are a combination of 838 and 914UB sections, that had to be delivered to site in three and four sections in order to construct the required building heights. Large column sections were designed into the frame as they have to support various internal high-level walkways and plant decks – all of which are being installed during the fit-out phase – as well as the 28.5m-long roof rafters. 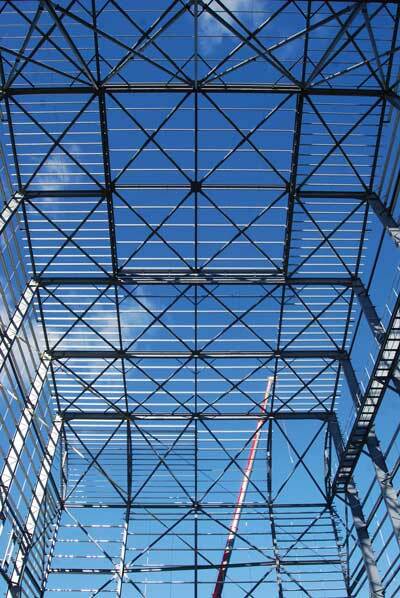 The main process building’s roof accommodates one of the project’s most interesting steel design features. Many biomass and energy facilities are constructed around the previously installed process boilers and turbines. However, on this project, that was not possible as the concrete slabs and groundworks on which this equipment sits were extensive and time-consuming and consequently not ready in time. To keep the project on schedule the steel frames are being erected first, followed by the equipment installation and fit-out programme. “The completed roof has two panels, each measuring 15m × 15m, which can be unbolted and lifted off with a crane to allow the boiler equipment to be installed through the roof,” explains Mr Bruton. 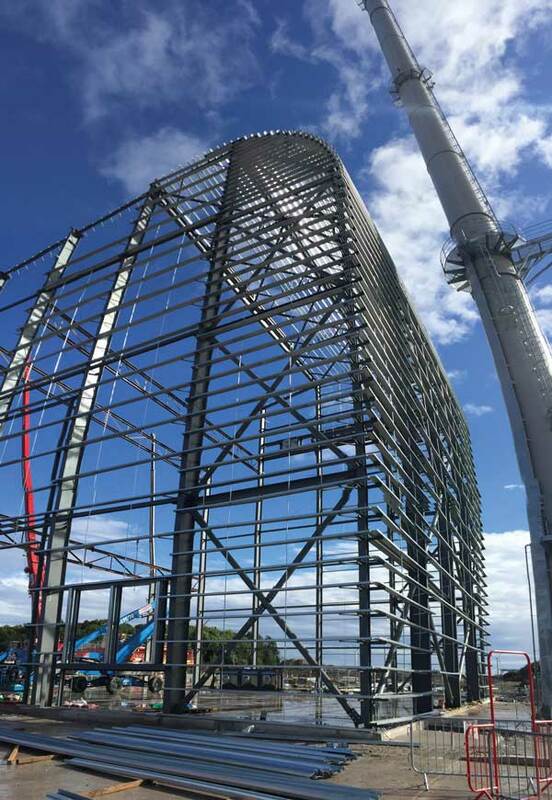 The final parts of the steel erection programme involved the construction of an administration and turbine building that adjoins the northern elevation of the main processing structure. The structure for this building is a structurally independent braced steel frame which is separated from its larger neighbour by a double column line movement joint. This structure is 49m-long – 15m-wide and is 20m at its highest point. Divided in half, the administration part of the building has two-storeys, while the turbine hall is a single storey open plan area. The project team had a similar conundrum with how to install the large turbine into an already completed steel frame. “We adopted a similar design to the main process building, but here we have altered the orientation of one roof rafter. This creates a large enough opening into which the turbine, which is delivered in parts, can be lifted through,” explains Mr Bruton. Once the turbine is installed the structure’s purlins will be added and the roof will be clad. All of these design features have kept the project on schedule to meet its completion date of March 2017. The equipment installation and fit-out programme will then begin, with the biomass facility expected to start operation in 2018.